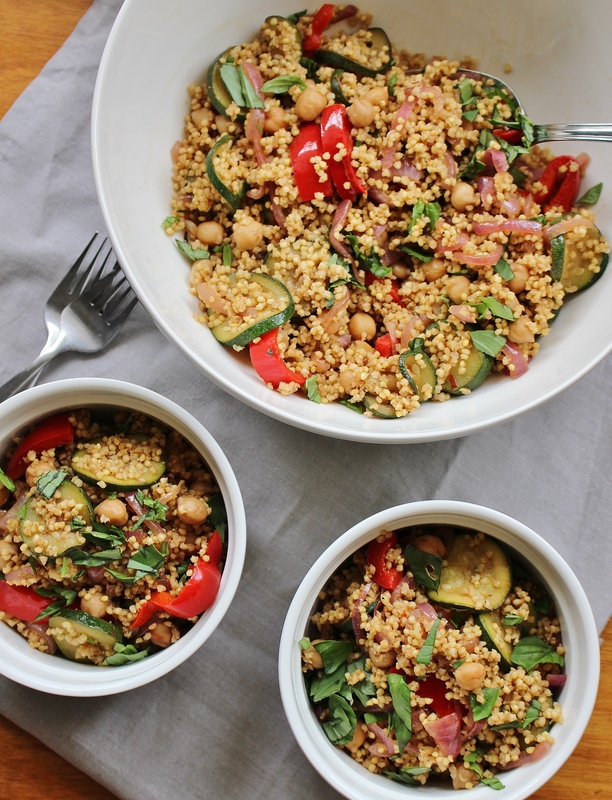 Bright, sauteed vegetables paired with mild and nutritious millet and bright herbs and spices makes for bowls of pure, gluten free, plant-based energy. Millet is a rich source of B vitamin, iron, and calcium making it the perfect seed (not a grain) for those who avoid meat, and it is naturally gluten free so it is gentle on tummies too. Energy is a funny concept. We are taught in school that ‘energy can neither be created nor destroyed, just transformed from one form to another’. (Pardon my science-nerd ways.) And we memorise the different forms of energy recognised by physics theory and pray that we can remember all of Newton’s Laws and leave it at that. As adults we learn the law of conservation of energy in different ways. Every day you have a certain allotment of energy to use during your waking hours. This precious, precious energy powers every situation, interaction, and move you make. I’m not talking about energy in the form of calories, but the deep down, soul-mined energy reserves that we have available to us when we open our eyes in the morning. Each situation extracts a certain amount from us: automatic tasks (cleaning teeth, showering etc) take very little; situations we enjoy can boost us up (snuggling with Chris in the mornings); and tense, stressful situations or people can drain us like energy vampires. One of my goals for 2015 is to work out what my ‘energy vampires’ are and vanquish them for good. The Huffington Post had a great article that provoked this goal, and in turn, this post. As I was pondering this article the other day I started to list what saps energy from me the most: Fear of Missing Out (majorly when I am sitting at home looking at gorgeous photos of places that aren’t Brisbane); losing just a little more weight (because we are never satisfied are we? ); trying to have it all ‘perfect and together’ all of the time (Type A, hello); and worrying about losing my job/disappointing someone (just an old ‘teacher’s pet’ hang up I suppose). After I had made this list I sat down and decided how to avoid/vanquish these situations because I want to use my time and space for good, not for feeling stressed out and ‘time poor’ all the time. It’s a work in progress, and it will take longer than a year because energy vampires will keep appearing in our lives throughout time. But here in 2015 I vow that my precious, precious energy will be conserved for making my life a happy, thoroughly nourished one. These bowls of ancient millet, sauteed summer vegetables, and (my favourite) chickpeas are a boost to energy stores for sure, and because this makes enough for four servings, there are plenty of leftovers if you come from a small household, or you can make it ahead for work lunches (leftovers will last up to three days in the fridge) – stress-busting bonus! Millet has a mild buttery-sweet flavour, and I cook mine in vegetable stock to give it extra saltiness. 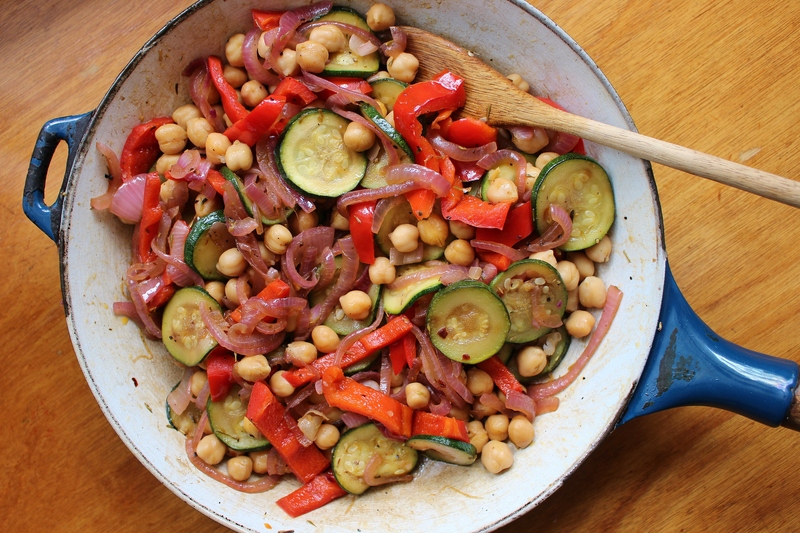 The farmers markets are bursting with fresh summer vegetables at the moment and in my Capsicum, Zucchini, Chickpea and Millet Bowls they are simply sauteed with chickpeas in olive oil, and dressed with balsamic vinegar, chili flakes, and dried thyme. Once the vegetables are silky soft, they are combined with the millet and tossed with summery basil and an extra glug of olive oil and balsamic vinegar. 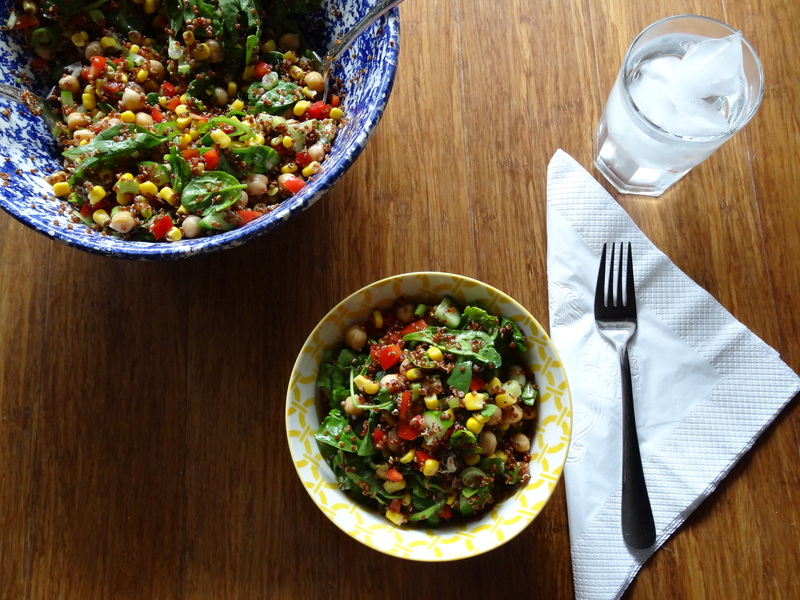 These bowls are filled with marinated summer night flavours. A smattering of olives doesn’t go astray as an extra topping here. Make them, sit down with someone who boosts your energy and let the sunshine in. Rinse millet well and then add to a medium saucepan with the vegetable stock. Place over a high heat and bring to the boil. Once the water is boiling, reduce the heat to low, cover with a lid and cook for 15 minutes, or until the stock is all absorbed. Then, remove from the heat and sit for 10 minutes before fluffing with a fork. 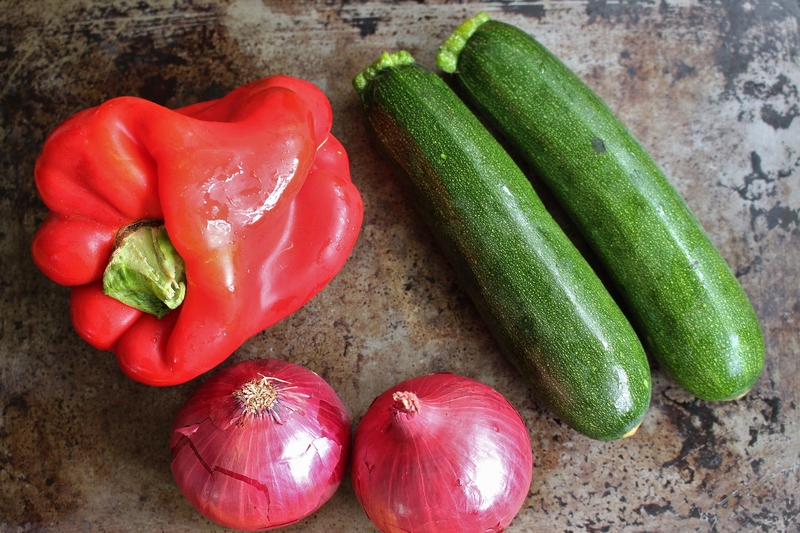 While the millet is cooking: peel and thinly slice onions, slice capsicum into thin strips, and slice zucchini into thin rounds. Heat 1 tablespoon of oil over a medium heat. Add onion and capsicum and saute until both are softened. Add zucchini, chickpeas, 1 tablespoon balsamic vinegar, dried oregano, and chili flakes (if using), and cook until zucchini is soft. 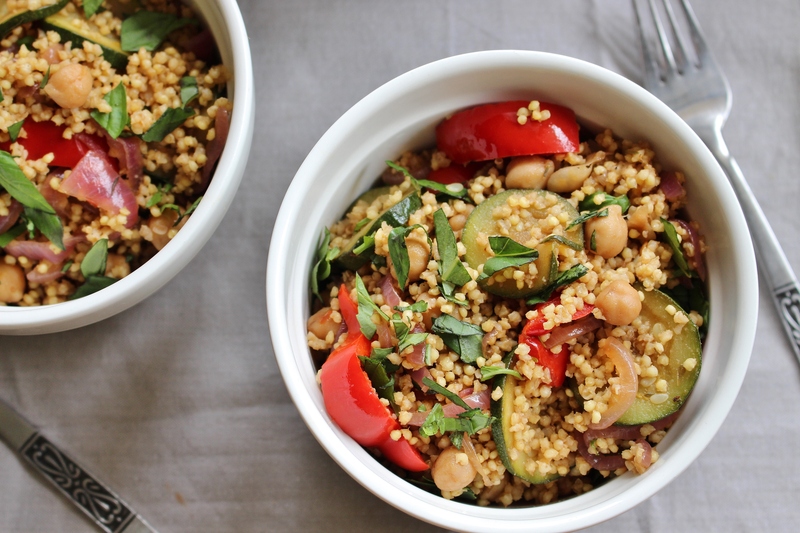 Once millet and vegetables are cooked combine in a large bowl and gently toss with remaining olive oil, balsamic vinegar, pepper, salt, and chopped basil. Tell me, dear reader, what are your energy vampires? How do you boost your energy? Anyone love millet as much as I do? I have a confession: as much as I love salad even I get bored of the same leaf, tomato, legume and antipasto combination. This often leads to me resorting to my next option: cottage cheese and crackers or avocado sushi. In an attempt to revamp my lunch situation, and to ease night-before-work decision-making fatigue, I made a big batch of this quinoa salad. 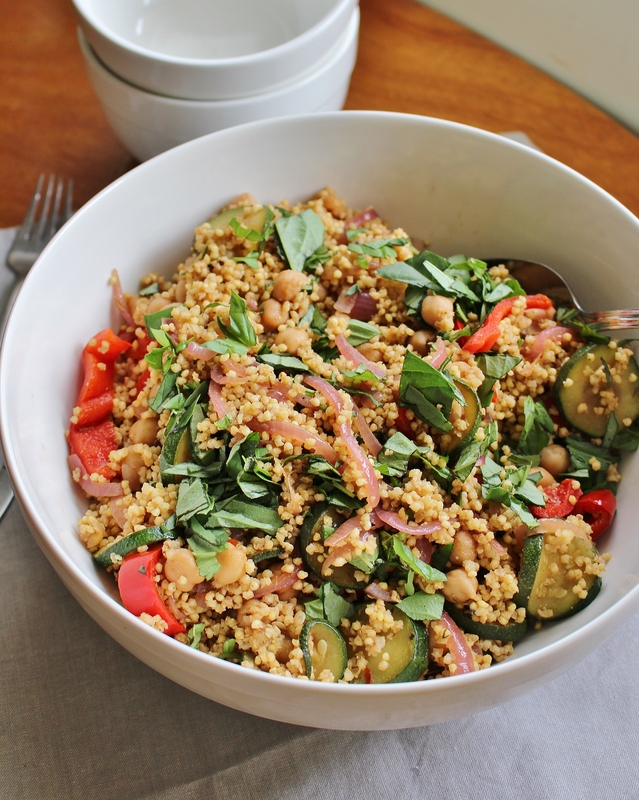 Full of bright vegetables, healthy protein (from the chickpeas and quinoa), fibre, and complex carbohydrates (slowly broken-down for longer-lasting energy and fullness) it will last in the refrigerator all week long safely divided into four lunchbox-ready containers. I have also made this salad for a work function and a family barbecue. It makes a perfect pot luck dish because it suits so many different special diets (gluten-free, vegetarian, dairy-free) while still tasting delicious (I’ve had reports). I simply doubled the amount and it made a healthy side dish for 10-12 hungry people. Vegetarian friends, this is a complete protein meal; omnivorous friends, I have reports that it goes rather nicely with grilled chicken or fish. Serves 4 as a main dish. 6-8 as a side dish. Rinse quinoa thoroughly and add to a small saucepan with the vegetable stock. Heat on a medium-high stove until it comes to the boil. Reduce heat to low. Cover pot and cook for 15 minutes or until tender. Drain well and return to pot to cool to room temperature. Meanwhile dice cucumber, capsicum, and spring onions. Drain corn kernels. Drain and rinse chickpeas well. 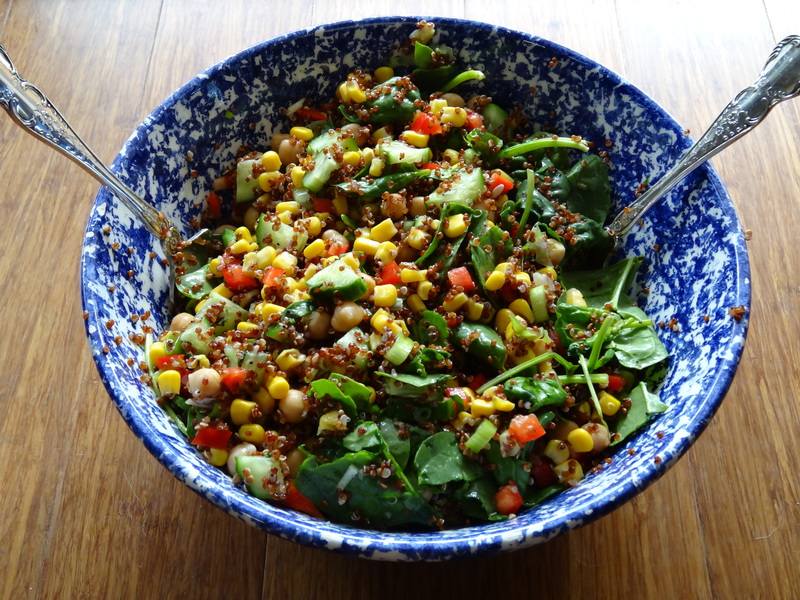 Add quinoa to a large bowl and add diced and drained vegetables. Toss mixture together with spinach leaves. To make the dressing whisk together all dressing ingredients. Add dressing to bowl and toss well. Serving suggestions: Perfect the way it is, although sometimes I crumble some feta over the top of mine, or add a sprinkle of pumpkin seeds. Omnivores may like to add grilled chicken or fish (dressed with some extra lime perhaps). Vegans you can substitute agave for the honey. Ready to Climb. Ready to Fall. 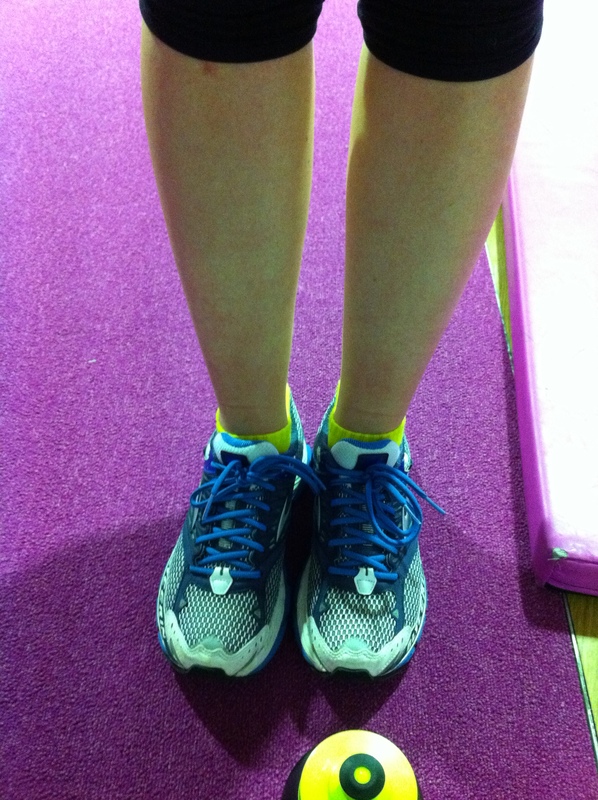 Four Days to the Cadbury Half Marathon. Four days until the Cadbury Half Marathon and I must admit that over the past few days I have been a little apprehensive/nervous/freaked out. Now, this is not unusual for me in the countdown to a major event, and I have learned to recognise this as part of the process of training for a race or preparing for other big moments. Still, I can’t help feeling a little panicked and when Casey asked me how I was feeling about Sunday I couldn’t hide the emotion from my voice. Once again, she was the voice of reason and told me to stop thinking about this as a massive race, and just think about it as another run, just another wonderful holiday opportunity, and to remember why I run in the first place. Of course, she is absolutely right. Thank you Case. Casey may have taste-tested these while giving me a pep talk. I took a moment and looked back at my training schedule. In the past couple of weeks I’ve successfully completed 16km, 18km (by two! ), and 20km training runs, so I know I can physically do this. The mental game is the only one left to play. At the end of the day I know I am not a contender to win the race, but that was never why I started running in the first place. I run because I love the way it makes me feel. I run because doing these races over and over that I am a runner, that I belong out there on the road. I run to remind myself that I love my body and I am so grateful for the things it can do, and the way that it has changed over the past couple of years, and the fact that it belongs to me so much more now because I know its limits and I’m not afraid to push them. ‘You can’t climb ’til you’re ready to fall’. So as I step out onto the road on Sunday I am ready to fall. Fall into the rhythm of the road. Fall into the pursuit of the finish line. Fall into the beauty of my life at the moment. Fall into the wonderful possibilities that this new year has brought to my door. I am ready to fall so that I may climb. 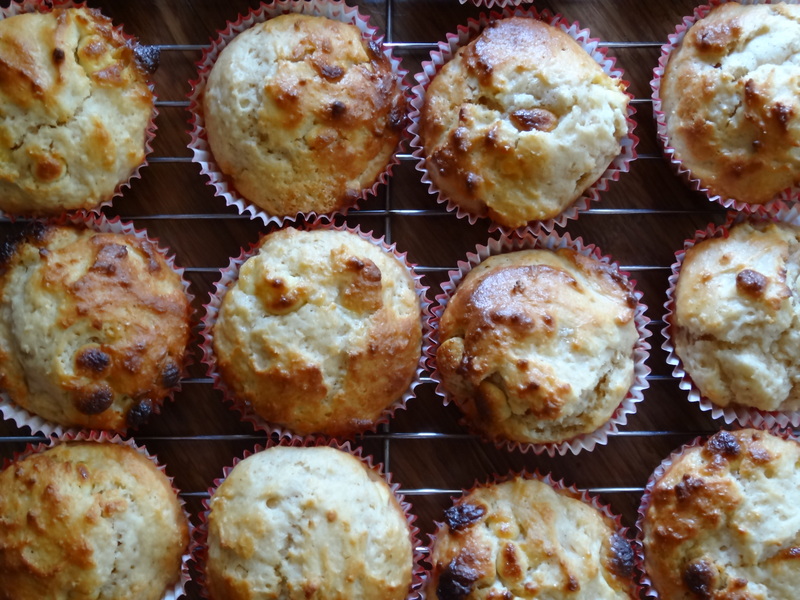 Preheat your oven to 200C (390F) and line 18 cups of two 12-cup capacity muffin tins with pretty papers. 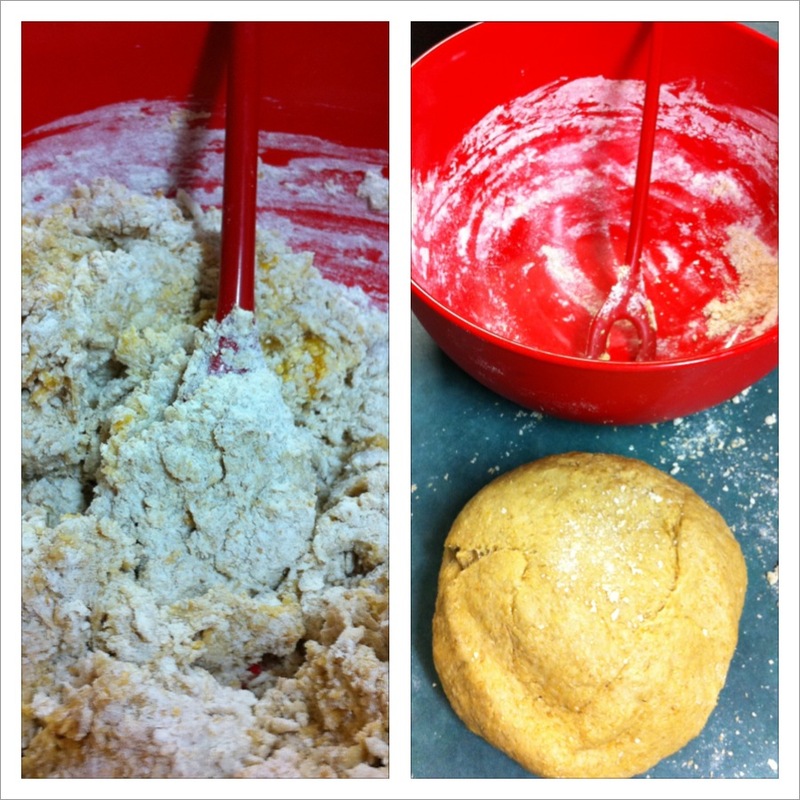 In a large bowl whisk together the flours, baking powder, sugar, and cinnamon. Form a well in the centre. In a separate bowl whisk together the yoghurt, milk, vanilla, egg, and oil until they are well blended. Add wet ingredients to the dry ingredients and whisk until almost combined. Do not over mix your muffins or you will end up with a tough crumb. Sprinkle chocolate chips into batter and mix in until distributed. If there are a few streaks of flour in the batter this is okay as long as there are no large pockets of flour. This is quite a thick batter. 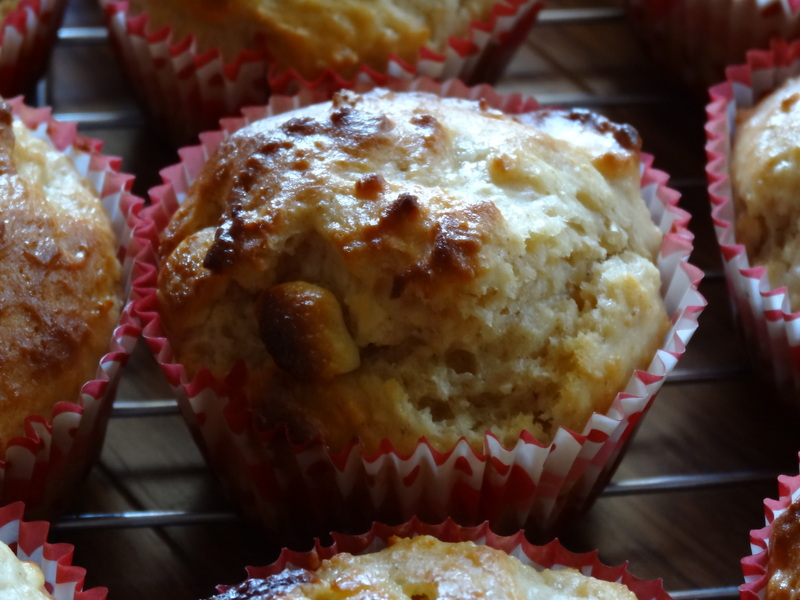 Distribute batter between muffin cups and bake for 12-15 minutes or until the tops spring back when lightly pressed. Remove from the oven and allow to cool for 5 minutes in the tins and then place on a wire rack to cool completely. Just gotta trust these babies and the work they’ve done over the past months. Share with loved ones who give you the courage to fall so that you can climb again. Tell me, dear reader, do you ever have to remind yourself to let go and just fall? Where do you find the courage to let go? Is there anything you are falling into at the moment? Some days life is hard, and great, and confusing, and exciting, and a little scary-wonderful. Sometimes a quiet year realises that its end is drawing near and hastens its course. Days flickers past your window without the opportunity to take stock of what is really important in that day. We become worried about having the right amount of things under the tree, about wearing the right dress to the office party, about the external and extraneous details rather than the internal and fundamental reasons behind this season and the opportunities it presents for us to look around and be grateful for our lives. Sometimes the speeding freight train of life is headed towards the cliff of a new year, and we need to pull on the emergency breaks and sit on the cliff for a while to admire the lights in the sky. 2012 has been a fairly quiet year for me, and then summer rolled around. Full of wonderful weddings and myriad celebrations, more intense training for the half marathon (only five weeks away), and the other pleasures of the Christmas and New Year season. December feels as though it is flying out of my grasp, and I don’t want to dismiss the beauty in each of the special occasions of this season. So, sometimes it is necessary to make cookies. Or sit in a quiet corner with a notepad and a pen, or zone out to some music while you take a walk, or however you manage to bring your heart and mind back to the present moment so that you can appreciate every wonder that you encounter. Last Friday night my family embarked on one of my favourite Christmas traditions, which always reminds me of the true beauty of this time of year. Every year we visit the Christmas tree that is erected in King George Square in Brisbane. We have dinner, see the tree, and admire the Myer Christmas windows. To me, this is when Christmas really starts, and I relax into celebrating the holidays, and soaking up every part of the season. These make wonderful Christmas presents, or an unexpected holiday treat for a neighbour. To toast the almonds: spread out on a baking sheet and place in the oven while it is warming up. Allow them to cook for about 10 minutes. Cool, and then chop. Preheat your oven to 180C (350F) and line two cookie sheets with baking paper. In a medium bowl, use a wooden spoon to cream together the butter, sugar, and vanilla until fluffy and light. Add egg and beat to combine. In a separate bowl whisk together the baking soda, cinnamon, salt, and flour. Add flour mixture to creamed butter mixture and beat until just combined. Add oats, chocolate chips, almonds, and cranberries to the dough and mix until all combined. Spoon out heaped tablespoons of mixture onto the baking paper. Leave about 3cm between cookies as they will spread a little when baking. Bake for 10-12 minutes, then remove trays from oven and allow cookies to cool completely on a rack. Tell me, dear reader, how do you remind yourself to slow down at this time of year? Any exciting early holiday plans? The first were handed over with a shy smile, and were clutched in my still winter-numb hands like precious amber and citrine nuggets. The next week as I exclaimed over the wondrous flavour of the previous week’s bounty, the smile grew wider. Summer bloomed, and brought with it more fragrant delights, tiny jewels moved from amber and citrine to garnet and deepest ruby. Firm, tart, and spring sharp melted with the lengthening hours of sunshine and became plump, ripened, and strained against their skin with sweet juices. The smiles grew wider too, and laughter followed. Sadly, summer came to an end, and the final harvest was mourned and celebrated: a ritual to fortify me with sunshine through the winter, until the new spring breezes blew fair weather our way again. But the smiles lasted through winter, through chapped mornings, and windy weather, freezing rain and hurried, scurried, greetings and partings. The smiles were the summer harvest that never had to end. This week the spring wind danced through the city streets, the sun stayed longer and longer in the sky, and the cold left only traces of itself in the wee hours of morning. A bright smile lit my face this week when I noticed the spring bounty atop the rickety wooden table. A sign taped below read: ‘hand-picked yesterday at our farm in Beaudesert’ – complete with pictures of my summer/winter friends out in the fields. I lined up with the other eager faces, sort of like mine but without the ebullient appreciation I must verbalise for how much I enjoy the produce, and how happy I am to see little amber and garnet gems appearing again. I smile, and receive smiles in return. I claim two punnets as my own. My friend empties in half the contents of a third, and adds two gleaming Granny Smith apples to the bag. ‘Just for you’ she says, with another smile. 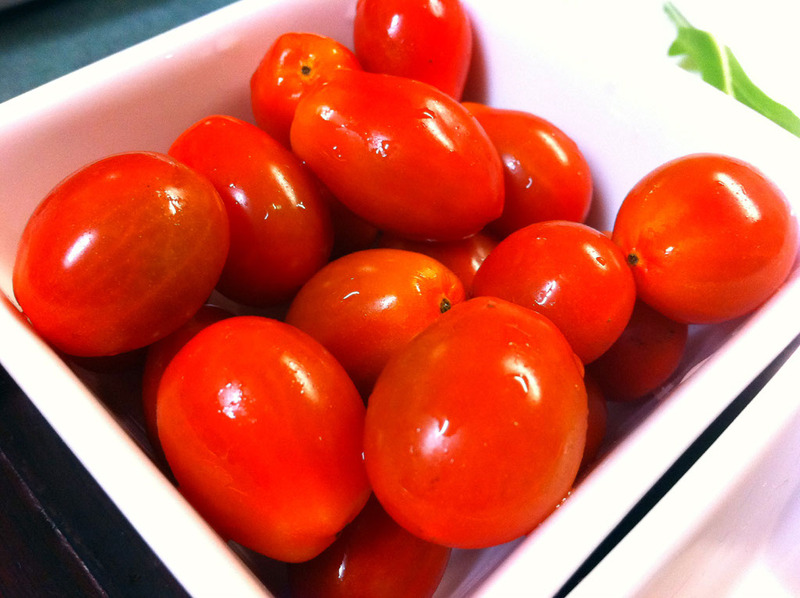 The best way to enjoy new season grape tomatoes, or if you can’t find these gems try cherry tomatoes. When winter meets spring I always get a taste for things with a little more acidity, the clean, sharp tastes seem to strip away some of the cloying richness of winter foods and leave my taste buds ready to experience the delicate flavours of spring, and their promise of summer’s richer bounty. Here, I have used lemon juice to sharpen the flavour of the salad, and peppery rocket to lift the rich brown rice. You can use milder baby spinach if you prefer. Place rice in a saucepan and cover with 2 1/2 cups of water. Bring to the boil over medium heat, uncovered. Once it has reached boiling point, turn the heat down and cover with saucepan lid. Simmer for 20 minutes. Then, turn off the heat and allow rice to sit for another 10 minutes while you prepare the rest of the salad. Wash tomatoes, and then slice in half lengthwise. Rinse butter beans until water runs clear, drain well. Slice spring onions including most of the upper parts of the green stems. Dice the semi-dried tomatoes and pit and dice the olives. 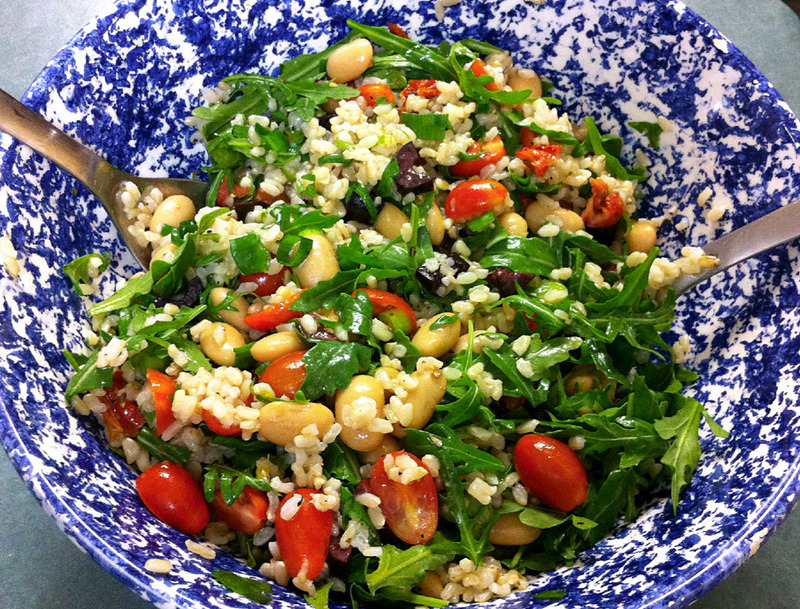 In a large bowl combine halved tomatoes, butter beans, spring onions, semi-dried tomatoes, and olives. Add rocket leaves. For the dressing: in a small bowl whisk together the lemon juice, olive oil, salt, pepper, and dried oregano. Add to the salad mixture. Spoon rice into the salad mixture, and gently toss the whole salad together. 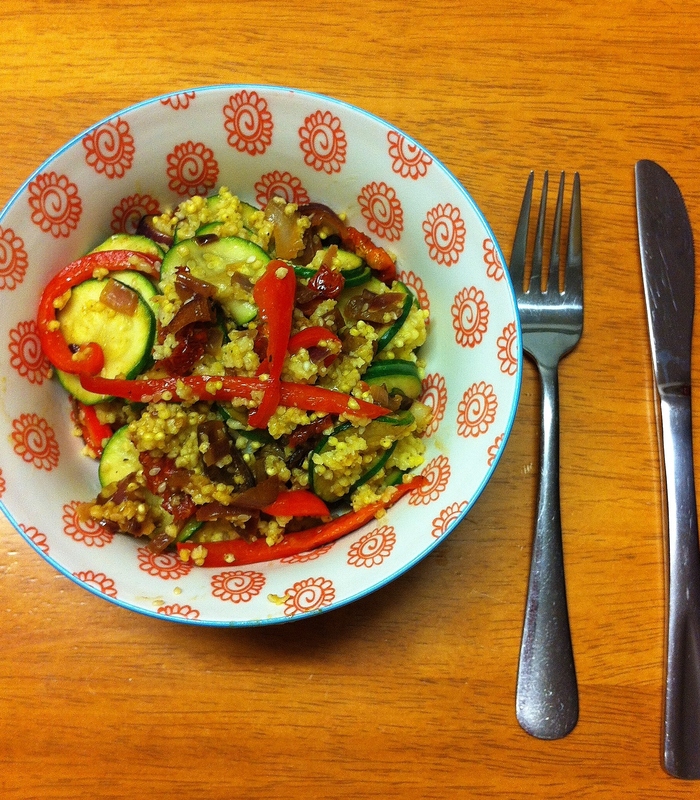 If you are dining solo, the left overs make a lovely lunch or dinner the next day. I like to add a little steamed broccoli on the second day, or some corn kernels. Enjoy. 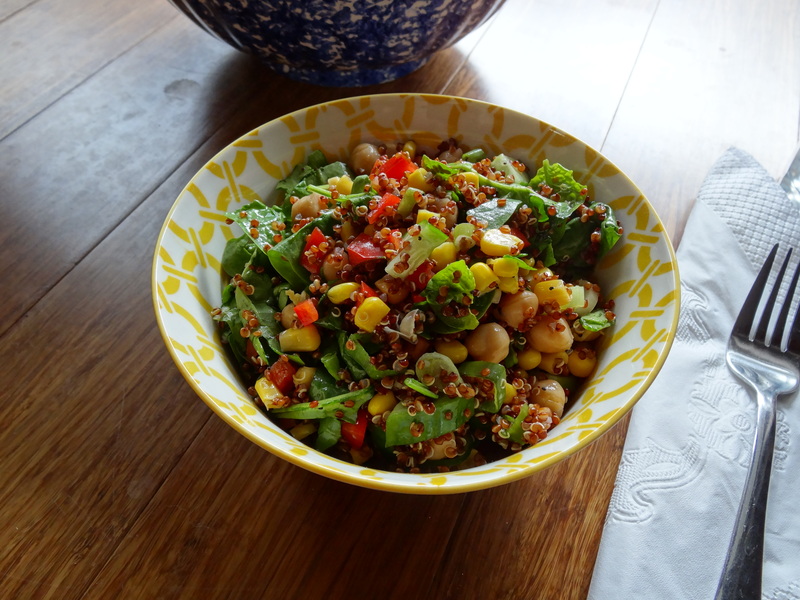 I am planning on sharing my favourite salads as we head into summer here in Australia. Tell me dear reader, do you have a favourite salad ingredient? Mine is obviously fresh tomatoes! Wednesday. Already the middle of the week again. I know that I am already thinking of the downward spiral that leads from the weekly peak of Wednesday to the under-the-covers-snuggle-pit that is the weekend. What better way to entertain thoughts and dreams of the weekend than to contemplate breakfast goodies that are sure to signal a sweet start. 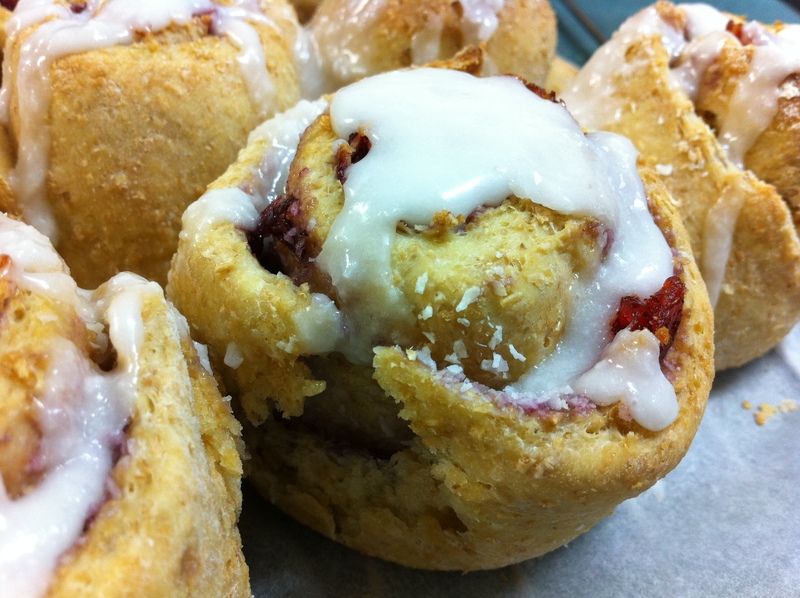 Without further ado my friends, I present Coconut Cranberry Scrolls. Perfect for a weekend breakfast, brunch, or any other smackeral of snacking in between. Inspired by, and adapted from, this beautiful recipe by Kim Laidlaw, in this book. While there are several steps involved in this process, and it can take a few hours from start to finish, there is a large amount of inactive time. If you like you can put this in the refrigerator overnight and simply bake them in the morning. If you would like to take that option I have included a note below. Besides, when you smell the sweet coconut and jam smell wafting from the oven you will be pleased you indulged in the ancient comfort of bread making. Place milk in a microwave-safe bowl and warm in the microwave for about 45 seconds. It should be warmer than skin temperature but not boiling. Pour milk into a large bowl and add yeast. Mix to dissolve. Allow yeast and milk to stand about 10 minutes. If your yeast hasn’t foamed after this time it is off so you will need to invest in some new yeasty creatures to get the best results. Add the sugar, eggs, flour, and salt. Mix with a spoon to form a shaggy dough. You can add a little more flour if need be. Turn dough out onto a lightly floured bench, and dot with the butter. Knead dough until smooth and elastic. This will take about 7 minutes. You may need to flour the bench a few times when you first start kneading. After you have finished kneading place dough in a large oiled bowl and cover the bowl with plastic wrap. Place in a warm spot to rise until it doubles in size. This will take about 1 1/2 to 2 hours. Line a baking dish with baking paper. Turn out dough onto a floured bench, and punch it down. Cut dough in half. Working with one half and a floured rolling pin. Roll out the dough into a rectangle measuring about 25 x 35 centimetres. Warm the jam slightly in the microwave for about 20 seconds. 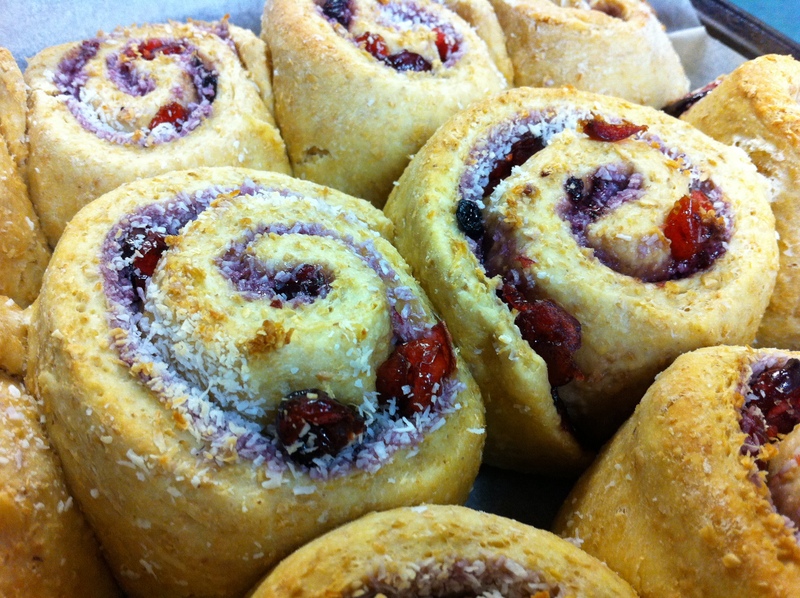 Spread half the jam on the dough. Sprinkle with 1/3 cup of the coconut and then 1/3 cup of cranberries. 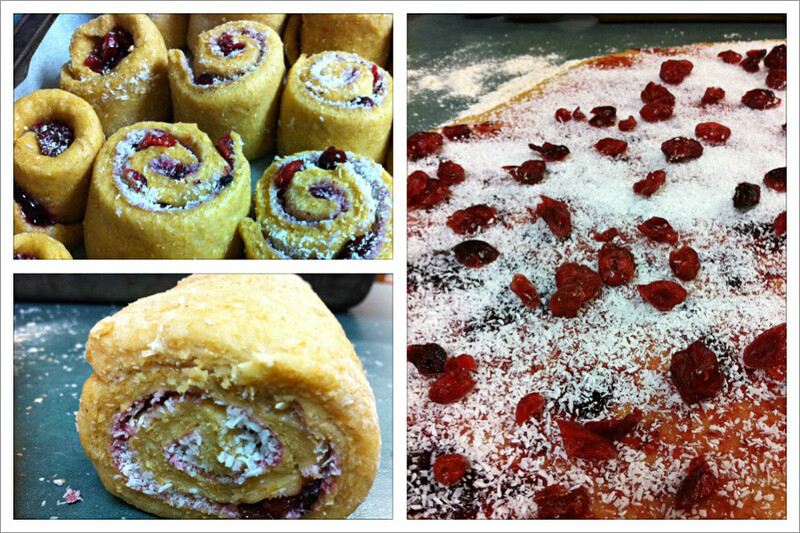 Starting from the long edge closest to you, roll across the dough to form a log. Using a piece of cotton (or unflavoured dental floss) cut the log of dough into 8 pieces. Place these (cut side down) onto the lined baking dish. Cover the dish lightly with plastic wrap, and allow to rise once again, in a warm spot. [If you would like to you can put them in the refrigerator at this point, and then just take them out an hour before you would like to cook them in the morning. Slide the puffily pretty rolls into the oven and bake for 20-25 minutes. Your rolls should be a beautiful golden brown, and a skewer inserted into the middle will come out clean. 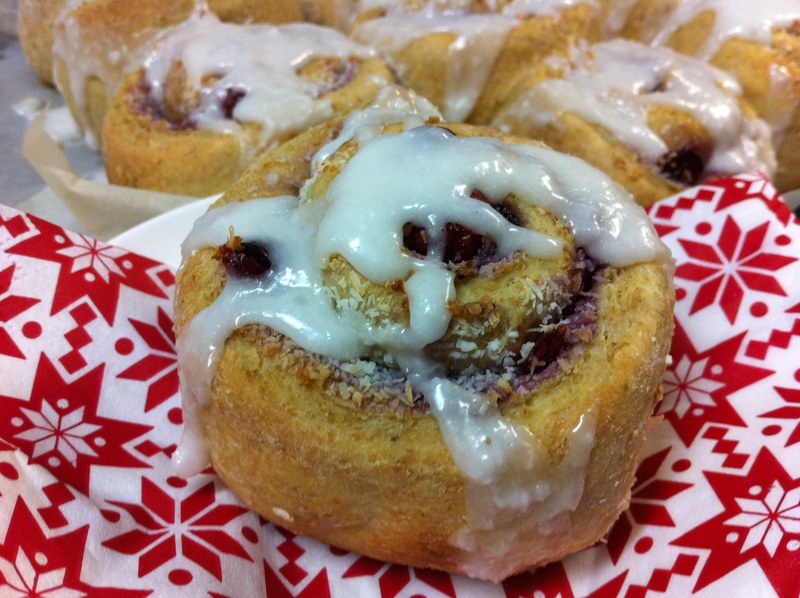 Remove rolls from the oven and while they cool a little prepare the frosting. To make the frosting simply mix coconut and icing sugar with enough water to make a thick paste. Drizzle frosting over warm rolls. Take a moment to revel in the blend of yeast, coconut, and warm fruit that will now perfume your immediate vicinity. This is life. This is good. Serve to your family, friends, or anyone who might randomly show up lured by the comforting promise that is baking bread. Or, gobble up as many as you can and enjoy some soul restoring alone time. Just one more, just because I can….